Of all the unusual places work trips have taken me to, I’d probably count Pakistan as up there. Whilst there is no need for me to travel there with JoJo Maman Bébé, I have been to Lahore 3 times now with previous jobs, so it’s with great excitement to report that one of our newest trade accounts has just opened a beautiful store in the city. My very first trip was filled with fear and family concern about my safety. No company would insure my trip yet I was still asked to go and actually – I’m very pleased I did. Despite a stressful hour spent at the airport wondering if I was going to be granted an entry visa (in truth I was more concerned about how many mosquitoes were biting me in the waiting room) an early morning drive into the city centre showed Lahore to be a surprisingly normal place! Flowers everywhere were in bloom with carefully manicured green gardens all over the city. People were sat on their terraces drinking tea and families enjoying walks in the large parks. All very calm and relaxed – what was everyone worried about? Everyone I met, without exception, was charming and very pleased to see a Brit visit – the hospitality and cups of chai endless. One of the most impressive things about life in Lahore is that life goes on – no matter what political drama is unfolding or whatever financial crisis is coming its way, life goes on. Everyone goes to work – kids go to school – the city rarely shuts down. At first, the thoughts of regularly visiting a city where bombs have gone off was admittedly daunting but after a while the thought passes. I was there, heard and, separately, saw a car bomb go off…I was naturally scared and it became the topic of conversation but the very next day it was back to business as usual – people there refuse to live in fear. Over subsequent trips, more positive sights popped up – it was clear to see that women in Lahore, quite rightly, have a great deal of independence. You can see scores of women drivers and shoppers at all times of the day and evening. Apparently many women in Lahore work, study, and even run businesses. Education levels have been rising rapidly but coupled with a drop in birth rates (from 7.1 in 1980 to just over 3.1 in 2011)the average household size has gone down which has led to women with fewer children having more freedom to pursue careers. This has led to more disposable income in families which in turn has led to a fresh thirst for western goods and better shops. Shopping in Lahore is fun – it’s a cultural and relational experience, and you can get some amazing deals. Whether it’s in a colourful bustling markets or an air-conditioned mall, you can’t beat the great sense of satisfaction that comes after a bit of friendly bartering but I haven’t been to Pakistan for 3 years and I am told it has gone through something of a revolution. Despite financial reports suggesting the Pakistani economy is in a shocking state, the retail and wholesale sector is currently worth about £30billion and has been growing at 5.3% in real terms for the past five years! The benefits of this growth have been visible throughout the country. While large shopping malls opening up has become common place in cities like Lahore and Karachi, national newspapers now carry advertisements for shopping malls in smaller cities around the country. The average Pakistani household is very clearly more able and more willing to shop than ever before. 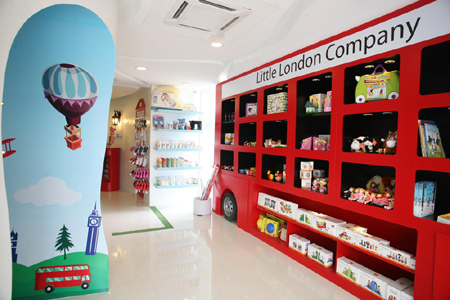 It really is exciting to see a couple from London go back to their home town of Lahore and open up a store for kids – they’ve named it ‘The Little London Company’ with a massive red London bus featuring in the store. Stocking up on sweets, toys and of course clothes, they had a hugely successful launch party a few weeks ago. JoJo Maman Bébé features heavily in their assortment with a rather obvious leaning to our recent Spring/Summer ranges given their 33 degrees heat! Along the way I have learnt how important the grandfather is when a new baby is born – most Pakistani families consider it the privilege of the grandfather to name the baby and another tradition is that the first garment for a baby’s layette is made from an old shirt that had belonged to the grandfather. That’s a tough tradition for us to incorporate into our assortment but we wish the store well and look forward to watching their progress. ← Our Dream Holiday Rental – I don’t think so!